Description of "Dictionary of Root Words (eBook)"
A root, or root word is a word which is used to form another word. It is also called a base word. A root does not have a prefix (a letter or group of letters added to the beginning of a word) or a suffix (a letter or group of letters added to the end of a word). Root is the primary lexical unit of a word, and of a word family. In this book, I have given the most common Greek and Latin roots which are used in English language. 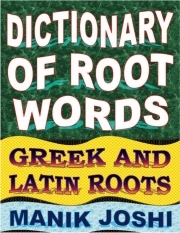 Reviews of "Dictionary of Root Words (eBook)"